More often than not, Windows 10 tries to take a dump on everything that you are doing and just decides to restart itself. Though not always, but this can happen in the middle of your work. Like when you have left your PC running for rendering a video or have scheduled some big file to be downloaded overnight. I have previously written on how to how to stop Windows 10 from restarting itself after an update. This, however, requires an app called the shutdownBlocker to stop Windows from accessing the shutdown.exe file, thus stopping the annoying restarts. While it works fine for most, it isn’t something that I like for my PC. This is because the shutdownBlocker needs to constantly run on the system to work. Fortunately, there is an another way. 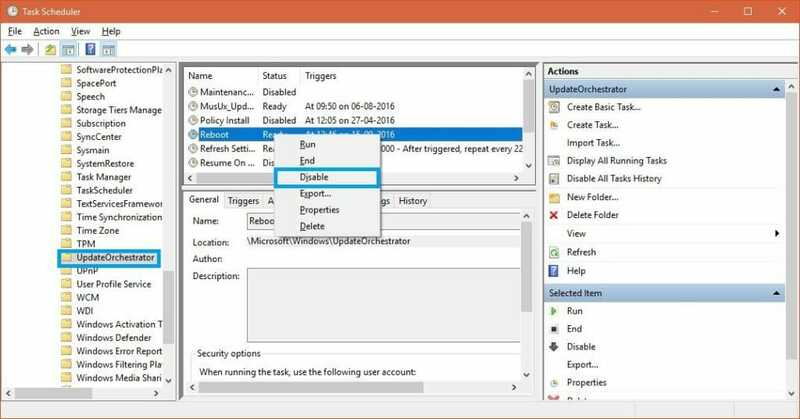 What you can do is use the Task scheduler in Windows to disable the Reboot task from running. This is somewhat similar to what the shutdownBlocker app is doing, however, this time, we don’t need it to run forever in the background. Continue reading below for the steps on how to do it. Open Task Scheduler by searching for it in the start menu. Once there, go to Task Scheduler > Task Scheduler Library > Microsoft > Windows > UpdateOrchestrator. In the middle pane, right-click on Reboot file and select Disable. Once that is done, you will need to take the ownership of the Reboot file. For that, right click on the lower-left of the screen and select Command Prompt (Admin). This will open a command prompt. In the cmd window, type cd C:\Windows\System32\Tasks\Microsoft\Windows\UpdateOrchestrator. This will take you to the UpdateOrchestrator folder inside Windows. Type takeown /F Reboot and press enter. Close everything and reboot your PC. This will result in all Windows updates being installed, but your PC won’t restart itself ever. This is because the restart task won’t be schedulable by Windows. Computer seems to hang upon restart after trying this on the “preparing to configure Windows..” Is this normal? Thanks. I don’t think you can take ownership or disable the Updateorchestrator anymore. Tried all these steps and windows just told me I didn’t have access privileges.